When it comes to the chemistry of your pool, there are abundant myths out there. 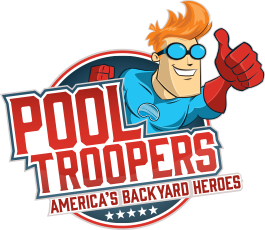 Pool Troopers wants you to have the right information about pool maintenance and water chemistry so that you can have a clean and healthy pool to swim in. Many myths are often heard when it comes to swimming pools, including the urban legend about a chemical that detects urine in the pool and causes pool color to change; that myth might just have had a purpose of keeping the swimming pool clean and free of contamination. Here are 10 myths often-heard regarding the chemistry and condition of your backyard swimming pool, along with the correct information. Myth #1: Your blond hair will turn green from chlorine. It isn’t the problem of chlorine; it’s the copper in some algaecides that cause the oxidized metal to attach to the shaft of the hair. Condition your hair before swimming or wash the green out with a color-stripping shampoo. 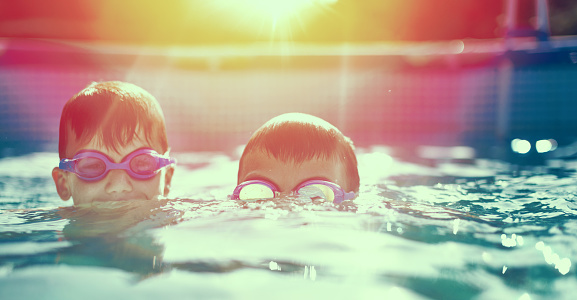 Myth #2: Chlorine will burn your eyes and turn them red if eyes are opened underwater. You may think that chlorine is the bad guy, but it’s actually the water with an unbalanced pH level that typically can cause this problem. Maintaining a pH level of between 7.2 and 7.8 will prevent burning red eyes. Another source of this issue is not enough chlorine sanitizer. Make sure your pool water is properly balanced, blue, and clear. Don’t swim in hazy turbid pools. If you do swim frequently, use goggles or a mask. Myth #3: A “chlorine smell” is the result of too much chlorine in the water. The “Chlorine” odor in the air is actually a signal that there is too little chlorine in the water and that the chlorine present in the pool has combined with organic material and swimmer waste to form Chloramines. Do not swim in this pool! The pool must be shocked or super-chlorinated to break down the chloramines and free up the chlorine. Click to find out more on with this tidbit in water chemistry. 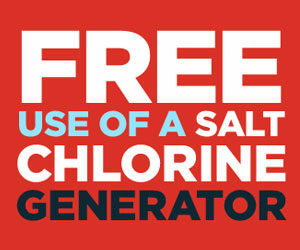 Myth #4: There’s no chlorine in the water of a saltwater pool. Saltwater pools are not chlorine-free. Saltwater passes a metal cell that creates natural chlorine with an electrical charge. Additionally, you must still routinely test the water in a saltwater pool. Myth #5: A clear pool is a healthy one. It’s the cleanliness, water chemistry, and its balance combined with the appealing blue clear water that signals it’s safe to swim in, not just the look of the pool. Pool chemical readings must be checked to ensure that there are no unhealthy organisms swimming about. Water should be tested regularly with a kit or with regular pool service. Myth #6: Chlorine in the pool is not safe. The true fact is that since 1908, this chemical has been used in the water of drinking supplies. The chlorine used in a swimming pool is safe as long as it is measured; the number of organic compounds in the water should also be kept at levels that are safe. This means the pool must be cleaned regularly and the other pool chemicals besides sanitizer need to be maintained and balanced. Myth #7: It is not necessary to shower before entering a pool if you showered in the morning. Organic compounds are found in sweat, urine, body oils, and cosmetics, and to minimize the organic compounds in the water, a shower is recommended. Myth #8: Swimming diapers on my baby will keep the pool clean. These diapers are not 100 percent leak proof. A baby left in a pool for a period of time will eventually contaminate it, even with a swimming diaper. Make periodic trips to the bathroom a rule for all young swimmers. Myth #9: It is always safe to swallow water in a pool that has been treated. Although most germs are killed by chlorine within a few minutes, Cryptosporidium can live for several days in treated water. An incident with pets or a baby in a diaper or a youth or adult with a loose stool can cause the pool to become contaminated, so swallowing the water could be a problem. You don’t drink bath water, try not to drink pool water. Myth #10: A strong chemical odor ensures that the pool is healthy and clean. Your pool should not have an odor that is strong. If it does, it may mean that there are high levels of contaminants present. A pool that is well-sanitized will have minimal detectable odor just like your white load of laundry after using bleach it should smell fresh and clean. A persistent chemical odor at your pool indicates that it is time to get the pool tested by a professional. These are the facts to obliterate the myths about pool water and its chemistry. When it comes to pool maintenance, Pool Troopers can help ensure that your water is clean and safe for your friends and families. In fact, there are several different pool maintenance packages available. You will no longer have to worry about the myths of maintenance as well as the health and safety of your swimming environment with the help of Pool Troopers. 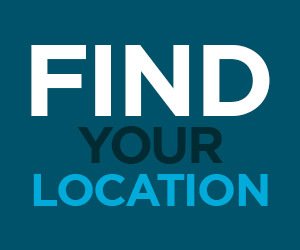 Contact us to schedule a service or learn more.